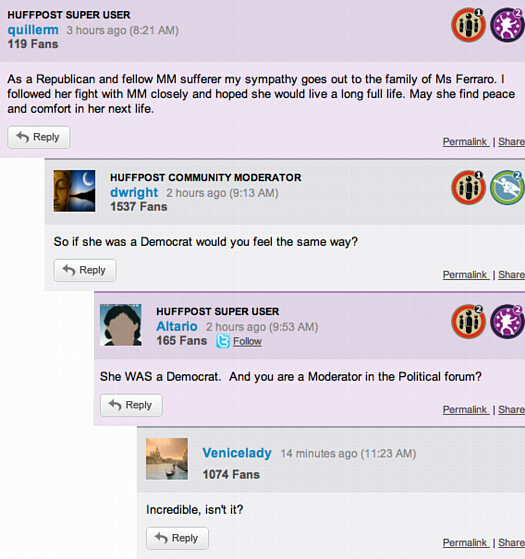 There’s a newfound interest in civil debate over at HuffPo, but it has its limits. Andrew Brietbart’s [sic] ad hominem attack on Van Jones in The Daily Caller violates the tenets of debate and civil discourse we have strived for since the day we launched. What a fake. I'm sorry, but I don't believe him...again. He doesn't want to be upped by Engel, and he wants to make a political statement on why they shouldn't have weapons. I saw the full clip and it looked like another Geraldo Fake...! Why would a sniper shoot at heralldough? Another staged 'event'? He's good at that. I wonder how many takes that took. I wonder how much he had to pay the rebels to waste their ammunition firing in the background. Well, you say, those comments may be ignorant and moronic, but at least they were civil about it. So how about a few death wishes? Shame they missed. Oh yes I did! Too bad none of them could shoot straight. How can I send those snipers a fan letter? Too bad they missed caterpillar lip. Now that’s civil discourse. And what are ad hominem smears without a few racial attacks? The libyan rebels probably said "hey look, there's that Jew from FOX News who changed his name to sound more hispanic”. The Fox "Coconut" (hard, hairy, brown exterior.. hollow, white interior) could probably take shrapnel without flinching. . a direct hit might crack him up!